Welcome to Mars takes its reader on a futuristic journey as one of the Martian pioneers of Buzz Aldrin’s very own crew. The images from NASA, vivid photographs, and computer-rendered drawings of an imagined journey to a settlement on Mars are sure to plant the seed of interplanetary wanderlust in its audience. The logistics of colonization are presented in an understandable but not overly-simplified manner, with intriguing sidebars such as “Your Favorite Five Pounds” and an imagined Mars menu. The included activities are the only part of the book that fall flat; they are a mostly confusing mixture, interrupting the pace of the reader’s journey and failing to add much to the content. However, the excitement that this book will instill in young space fans is sure to have them searching for their own ways to learn more about the many different components of life on Mars presented here. Welcome to Mars, teaches you how it would be to live on Mars and how Mars is similar to Earth. Buzz Aldrin who wrote this book was the second person to walk on the moon. He teaches you that Mars have some natural entertainment, in which it could be possible to ski on Mars and how you could grow food there. Mars is livable because it's days are similar to Earth, it has four seasons, and has water. This is great book to teach students about Mars and the planets, in which they could compare and contrast Mars to Earth, since Mars is the only other planet we know right now that humans could live on. Welcome to Mars: making a home on the red planetNational Geographic Kids, Washington DC, 2015ISBN 978-1-4263-2206-8Nonfiction/fiction96 pages : color illustrations ; 26 cm.Dewey: 523.43Interest Level: grades 3-6; Reading Level: 5.6Lexile measure: 9003 out of 5 starsRecently, I have seen several magazines that have covers featuring "Mission to Mars" and the National Geographic Channel has a special airing soon as well. As I began to read Welcome to Mars I wondered if I had missed some recent announcement from NASA that dealt with sending a manned mission to Mars. From the tone of the book it really seems that this travel and colonization is imminent. I actually did some research and found that while there is a goal to send a human to Mars in the 2030s, there are no concrete space programs planned beyond further exploratory rover missions.So while I am still not sure about the glut of recent Mars literature, I will speculate that it has something to do with increasing the PR for the space program and encouraging young people to still be fascinated with space travel. With that thought in mind, I tried to look at this book as it relates to building excitement and inquiry in a younger generation of potential astronauts and space travelers.On the positive side, many elementary schools use National Geographic in classroom reading programs, so kids will be familiar and comfortable with the layout and style of the book. Here is the magazine:As you can see, the colors and format are very similar to what can be found in the book (below):There are lots of photographs included in the book, and the text blocks are kept to shorter lengths. These are appealing features to elementary age readers.Overall though, I felt the book was confusing in its flow and intent. This is one of those books that I would question about placing in the nonfiction section of the library. The parts of the book that directly suggest you are a space traveler colonizing Mars, are clearly made up, and it wasn't really clear from formatting or transitions which parts of the book were made up and which were informational. For example, on page 55 is a section titled "The Interplanetary Spaceport." This section begins in the fictional realm by stating, "The two previous missions identified the best place to put our first spaceport," however immediately following this there is factual information about the topography of Mars and areas that would be more habitable than others. Then we switch to fiction and read, "The spaceport we're landing at will be located near the Martian equator," and then more factual information.As an adult, I struggled with the movement back and forth between fiction and nonfiction. On page 32 the text says "when you observe Mars through our telescope here on the cycler," and I couldn't remember if the cycler was real or imaginary. I had to flip back to page 20 to remind myself that it was a concept presented by Aldrin.Welcome to Mars wouldn't be one of the "must-have" books that I would recommend for an elementary school library. I feel that the purpose of the book is not clearly defined from the beginning for young readers and therefore gives them incorrect messages about the current state of the United State's space program as it relates to exploring Mars.An interesting side note is that the National Geographic Kids Magazine that features "Mission to Mars" is very well done, and even includes some of the same visuals as the Welcome to Mars book. The magazine article starts out clearly stating its purpose, "It's the year 2035, and you've been selected to join NASA's newest astronaut class. Your assignment: Travel to Mars...Here's your guide to everything you need to know about surviving life on Mars." Very concise in its purpose and the information that it shares with young readers, I would highly recommend the magazine article. If you've ever seen the episode of 30 Rock where Buzz Aldrin yells at the moon with Liz - then you understand a little bit of the wackiness that inhabits this book.Overall, very interesting and engaging nonfiction about travelling to and colonizing Mars with great hands-on experiments and demonstrations to explain the concepts.Would recommend to upper elementary and middle school students who are at all interested in space travel. The text is accessible, but the content is fairly sophisticated (and has an entertaining voice). World-famous astronaut, Buzz Aldrin, may have walked on the moon, but now he has his sights set on Mars! In Welcome To Mars: Making A Home On The Red Planet, Aldrin explores the very real idea of humans settling on Mars. Aldrin takes young readers on a fascinating and informative journey to the red planet and lays out his dream of one day making this awe-inspiring planet a home for humans.Welcome To Mars: Making A Home On The Red Planet is full of interesting facts, inspiring ideas, and a lot of passion. Aldrin explores the ins and outs of Mars, detailing all of its amazing qualities and statistics, through age-appropriate terms and explanations. Welcome To Mars: Making A Home On The Red Planet, excitingly places the reader directly in the narrative, asking them to imagine they are one of the first settlers on Mars. Young readers will be absolutely captivated by this out-of-this-world journey, as they learn all about what Mars has to offer and what their could-be-home will be like. From the building of homes to the growing of food, daily life on Mars, recreational activities, and more, Aldrin covers it all.Welcome To Mars: Making A Home On The Red Planet incorporates real photography and digital illustrations throughout the book. These pictures and illustrations do a wonderful job of capturing Aldrin’s passion for Mars and sparking the imagination and curiosity of young readers. There are also fun activities and experiments sprinkled throughout Welcome To Mars: Making A Home On The Red Planet that readers can try at home.my final thoughts: Readers of all ages will never look at Mars the same way after reading Welcome To Mars: Making A Home On The Red Planet! Buzz Aldrin takes a wondrous and huge idea and explores it in a way that will inspire, entertain, and captivate. Book provided by publisher.This well illustrated book by space experts lays out why people should colonize Mars and describes what preparations need to be made for such an excursion. From details of packing and the flight to equipment used on Mars and the natural resources of the planet, everything is covered with full but easy to understand descriptions. The history of space travel, with an emphasis on exploration involving Mars covered, is and there is a nice time line. The descriptions of how the crew will reuse parts of the ship to form a habitat, and the in-depth discussion of how food would be grown are most interesting. Aldrin makes a good argument that not only is inhabiting possible, but it is a great idea.Strengths: Young readers are always interested in daily life, so mock ups of living quarters, typical menus, and even a picture of a Martian basketball court will intrigue them. Science teachers will appreciate the detailed descriptions of atmospheric conditions and the surface differences of Mars. There is a nice bibliography as well as a glossary. Weaknesses: The computer generated pictures always look odd to me, but don't seem to register with students. I could have done without the activities, which were printed in very small font. 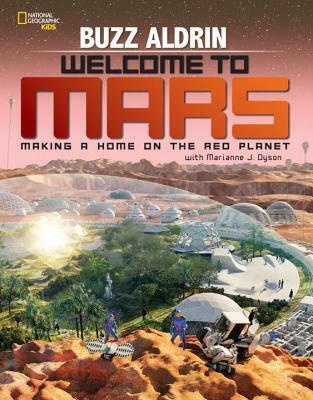 WELCOME TO MARS: MAKING A HOME ON THE RED PLANET by Buzz Aldrin and Marianne Dyson takes an amazing look at the near-future reality of a human colony on Mars.Readers are invited to become Martian pioneers as they work their way the information they’ll need to journey to Mars and build a permanent home. This visually-rich, well-organized book includes short chapters dealing with key issues related to space travel and the colonization of Mars. Numerous fun activities, author side-bars, interesting fact boxes, stunning photographs, detailed illustrations, intriguing diagrams and primary source documents add to the appeal. A timelines and map of Mars are particularly interesting. The book concludes with book and website lists, a glossary, credits, and an index.Librarians will find an eager audience for this timely work of nonfiction. With movie The Martian coming out in October, the book is sure to be a hit. Plan an event around this interest in Mars. Pair the book with the many NASA websites featuring information about Mars.To learn more about Buzz Aldrin, go to http://buzzaldrin.com/.To learn more about co-author Marianne Dyson, go to http://www.mariannedyson.com/.Published by National Geographic Children’s Books on September 1, 2015. Do you want to visit Mars? Are you curious about what it would be like to live on Mars? Buzz Aldrin, is an astronaut and the second person to ever walk on the moon. In this wonderful fact filled guide, he invites readers to travel to Mars, build a livable environment and stay there.Readers will learn how Mars compares to Earth. A day on Mars is similar to a day on Earth. And most importantly, Mars has water. Readers will learn about how they could travel to Mars and what they would need to bring. As readers turn the pages there are plenty of activities with cool things to create. Activities with step-by-step directions show readers how gravity works, where to find the red planet and even how to build a sample home of what people might live in on Mars.There are many photos of Mars and our recent visit, scientific diagrams, activities, glossary and resources to learn more about Mars. Parents and teachers will enjoy this guide to Mars and will want to add this to a home or school library. It’s time we started getting ready to live on Mars. While I am not interested in going to Mars myself, the ideas is certainly an intriguing one. This book by former astronaut Buzz Aldrin addresses what it is likely to take to get there and survive there on a long term basis. Aldrin points out about where science is now in terms of getting there (rockets, supplies, etc). and then shares what it will probably take to allow people to live there. I found that fascinating and very intimidating. Those who go will have to depend on people from earth to keep them supplied with certain things, but will be on their own if certain things go wrong. The activities included in the book add a fun touch to the content in terms of helping young readers understand some of the challenging concepts that are presented. I also found the comparisons to the conditions on earth to be completely fascinating. This is a great book for young readers who dream of going to Mars or helping the process. I really like books that speculate on how things will be if and when we colonize other planets. This book delved into that a little bit, mostly in the later chapters, and spent a good deal of time on the history of our attempts to reach Mars as well. I think I would have liked it more if it had spent more time on the speculation, but it was still an interesting book. Written for late middle or early high schoolers, it would be a good book for research on this topic in those age ranges. Very informative and readable non-fiction about what it would take to support human life on Mars. The information is broken into sections that make it very accessible for any reader. Lots of good illustrations as well. I found it to be fascinating and I think kids interested in space will enjoy it also. I thought this book was very interesting. It was about people moving to Mars in the future. I have never thought about that before and am very curious now about the possibility of seeing this in my lifetime. I've always wanted to be an astronaut (who doesn't) and now you thanks to the ultimate astronaut, Buzz Aldrin, you can be a space explorer too! An interesting look on how Mars could be colonized. This book contains a nice collection of science experiments for kids. Lots of good information here, wanted more! Looking forward to give this as a gift to my space-minded nephew. A children's book, but full of interesting facts about Mars. Useful if you want some very basic information about what it might take to colonize the planet. Read this book to my 6 and 8 year old over a few weeks and it was a great introduction to ideas about traveling to Mars. I might pick up Mission to Mars because of this. Buzz Aldrin Marianne J. Dyson - Buzz Aldrin (born Edwin Eugene Aldrin, Jr January 20, 1930) is an engineer and former American astronaut, and the second person to walk on the Moon. He was the lunar module pilot on Apollo 11, the first manned lunar landing in history. He set foot on the Moon at 03:15:16 (UTC) on July 21, 1969, following mission commander Neil Armstrong. He is also a retired colonel in the United States Air Force (USAF) and a Command Pilot.Aldrin was born in Glen Ridge, New Jersey, to Edwin Eugene Aldrin, Sr a career military man, and his wife Marion (née Moon). He is of Scottish, Swedish, and German ancestry. After graduating from Montclair High School in 1946, Aldrin turned down a full scholarship offer from MIT, and went to the US Military Academy at West Point, New York. The nickname "Buzz" originated in childhood: the younger of his two elder sisters (Fay Ann) mispronounced "brother" as "buzzer", and this was shortened to Buzz. Aldrin made it his legal first name in 1988.Buzz Aldrin graduated third in his class at West Point in 1951, with a Bachelor of Science degree in mechanical engineering. He was commissioned as a Second Lieutenant in the US Air Force and served as a jet fighter pilot during the Korean War. He flew 66 combat missions in F-86 Sabres and shot down two Mikoyan-Gurevich MiG-15 aircraft.Subsequent to the war, Aldrin was assigned as an aerial gunnery instructor at Nellis Air Force Base in Nevada, and next was an aide to the dean of faculty at the US Air Force Academy. He flew F-100 Super Sabres as a flight commander at Bitburg Air Base, West Germany, in the 22d Fighter Squadron. In 1963 Aldrin earned a Doctor of Science degree in astronautics from MIT. His graduate thesis was "Line-of-sight guidance techniques for manned orbital rendezvous", the dedication of which read, "In the hopes that this work may in some way contribute to their exploration of space, this is dedicated to the crew members of this country’s present and future manned space programs. If only I could join them in their exciting endeavors!" On completion of his doctorate, he was assigned to the Gemini Target Office of the Air Force Space Systems Division in Los Angeles before his selection as an astronaut. His initial application to join the astronaut corps was rejected on the basis of having never been a test pilot; that prerequisite was lifted when he re-applied and was accepted into the third astronaut class, the first selection for which he was eligible.Aldrin was selected as part of the third group of NASA astronauts selected in October 1963. After the deaths of the original Gemini 9 prime crew, Elliot See and Charles Bassett, Aldrin and Jim Lovell were promoted to back-up crew for the mission. The main objective of the revised mission (Gemini 9A) was to rendezvous and dock with a target vehicle, but when this failed, Aldrin improvised an effective exercise for the craft to rendezvous with a co-ordinate in space. He was confirmed as pilot on Gemini 12. Aldrin set a record for EVA, demonstrating that astronauts could work outside spacecraft.On July 21, 1969, he became the second astronaut to walk on the Moon, keeping his record total EVA time until that was surpassed on Apollo 14. Aldrin's first words on the Moon were "Beautiful view. Magnificent desolation. "After leaving NASA, Aldrin was assigned as the Commandant of the USAF Test Pilot School at Edwards AFB, California. In March 1972, Aldrin retired from active duty after 21 years of service, and returned to the Air Force in a managerial role, but his career was blighted by personal problems. His autobiographies Return to Earth, published in 1973, and Magnificent Desolation, published in June 2009, both provide accounts of his struggles with clinical depression and alcoholism in the years following his NASA career. His life improved considerably when he recognized and sought treatment for his problems. Since retiring from NASA, he has continued to promote space exploration.